City planners in Copenhagen launched a new “cycle superhighway” in April, extending from the western suburb of Albertslund into the city proper. This route is the first of 26 planned routes set to comprise a 300-kilometer (186-mile) system. The 20-kilometer (13-mile) corridor scrolls through bucolic suburbs on its way into Copenhagen, adding to 349 kilometers (217 miles) of existing urban bikeways in a city where more than one-third of the work force commutes by bike. The cycle superhighway network has been designed to be a viable alternative to cars or public transit. 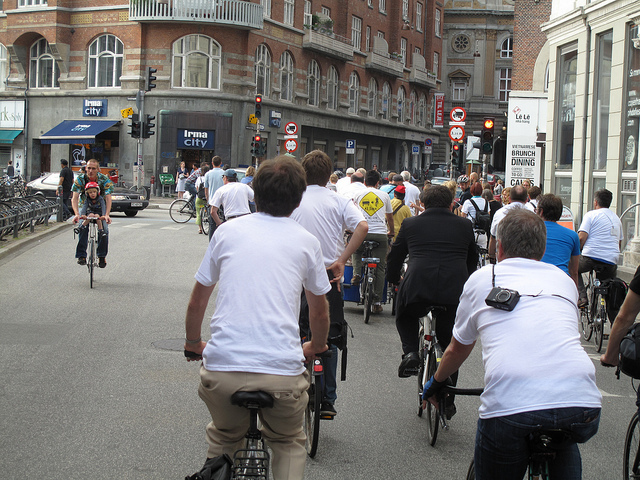 Though there are many different visions for cycling infrastructure, Copenhagen is adding the cycle superhighway to an extensive suite of biking options, including existing urban bike lanes and a free bike share system. This suburban “commuter line” adds value to the 1.3 billion kroner (US$214 million) Danish cycling economy and sets a successful precedent for future routes. 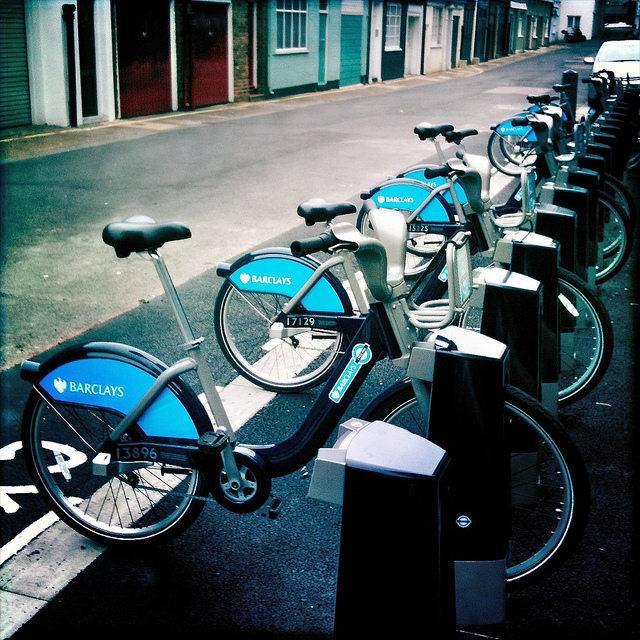 Bike share units at a well-used dock outside Paddington Station. Photo by Stew Dean. Meanwhile, in London, a city preparing for a major strain on all parts of its transport network during the 2012 Olympic Games, a four-route cycle superhighway currently crisscrosses the metropolitan area, complementing its bike share system, The Barclays Bank-sponsored cycle superhighway is set to expand an additional eight routes at about 15 kilometers (9 miles) each, connecting many of London’s outer boroughs to the city center. The availability of bikeways and bike share is expected to increase overall bike traffic well above the 107 percent increase in biking that has already occurred in London since 2000. A regular cyclist in New York down Broadway, a thoroughfare with dedicated bike paths. Photo by Jason Yung. 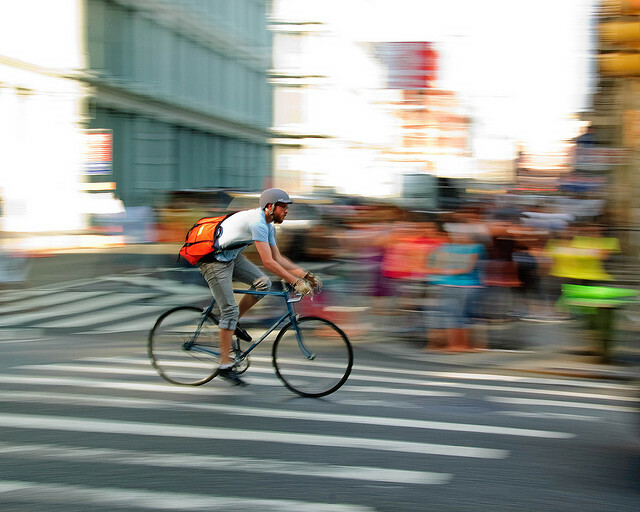 New York City has had growing pains in establishing its bike infrastructure program but has largely established its place as a bicycle haven with more than 300 miles (428 kilometers) of bike lanes across all of its five boroughs. Though these routes do not compare to the length of cycle lanes in Copenhagen, the Citi Bike bike share service is set to roll out the first of what is planned to be a 10,000-bike system next month, allowing for tourists and commuters to use these bike lanes from the Brooklyn Bridge to Times Square.